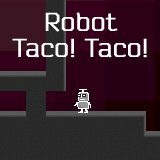 You are a taco hungry robot in this action based puzzler. Using a lazer shooting, detachable, flying head, your goal is to eat as many tacos as possible over the coures of the game’s 20 levels. Games Similar Robot Taco! Taco!